Timbre Russian Accordion Group (Русский тембр) - accordion professional group from Russia, which plays the unique instruments made by the Russian Engineer Nikolai Kosorukov called timbre accordions. Those instruments dont have any analogues in the world. Their sound quality resembles closely that of symphonic orchestra wind instruments made of brass or wood. So they were called Oboe, Clarinet, French horn and Tuba. 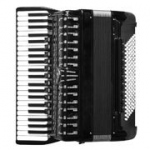 The traditional multitimbral accordion is also used in the Group.